Good day, everyone! I hope you are all doing well and that start of fall is treating you well also. This puzzle is all about grand entrances, as each of the four theme entries are multiple-word answers in which the first word is also a word that can also come after the word “grand” to make a common phrase. Well, ain’t life grand?!? On this day, and in this space, it totally is! CANYON OF HEROES (46A: [Downtown location of New York City’s ticker tape parades]) – More on this later in the blog. Probably the only real hold up in solving was not being 100 percent sure of the terminology of DOGIE, as well as which specific baby animal is called such (31D: [Herd youngster]). Though, as I typed that last sentence, I wondered if that old country-western “get along little dogie” song is in reference to that. (Researching at the moment before continuing this blog…Yup, it is!!) It’s funny how you hear of something a number of times, especially when younger, but don’t think twice of it until much, much later, and “dogie” is definitely that for me right now! I’m pretty sure I heard that song first in a Looney Tunes cartoon that featured Foghorn Leghorn. Now I’ll be looking for that on YouTube and be sucked into looking at cartoons online for about two hours. As I said, other than that, no trip-ups, and, as I was solving, there was not any entry that really stood out one way or another – maybe outside of the fact that I’ve yet to try RHUBARB PIE (29D: [Tart, fruity dessert]). Speaking of never trying foods, at least making them in a certain way, SHIRRed eggs have never looked appealing, probably because I don’t put too much on my eggs other than shredded cheese and definitely do not envision putting cream in them before cooking (44D: [One way to cook eggs]). Maybe one of you has a real good shirred egg recipe that you can share! “Sports will make you smarter” moment of the day: CANYON OF HEROES (46A: [Downtown location of New York City’s ticker tape parades]) – Over 200 parades have taken place on the route called the Canyon of Heroes, as each parade goes down Broadway on its way to City Hall. (The parade route stars in Battery Park). Though most of the parades have honored returning veterans and achievements in different fields, probably most people in the NYC area remember the parades held for NYC-area sports champions. Nine of the New York Yankees’ 27 championship teams have paraded down the Canyon of Heroes. The last sports team to be honored on the Canyon of Heroes was the 2015 United States Women’s National Soccer Team that won the 2015 FIFA Women’s World Cup, the first women’s team to be honored with a procession along Broadway. Thank you very much for your attention, everyone! Have a great rest of your Tuesday and, as always, keep solving!! Take care…or, should I say, ADIOS, AMIGOs (11D: [Parting words in Mexico City])! 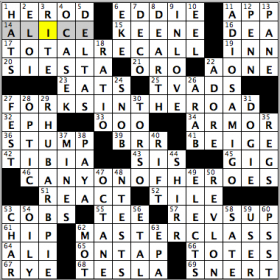 Loved the clue for 1A, which allows for the former bachelor, now HUSBAND to be of any sexuality. No heteronormativity implied in the clue! (Shout out to my husband of 3+ years, Ben.) I also enjoyed AROMARAMA, INCISOR/MOLAR, and XENON. The phrase [“Va-va-___”] VOOM, on the other hand, felt icky to me and connotes men objectifying women. Blerg. That is less than stellar and, at least in my casual counting over the years, reflects a tendency in puzzles to feature and clue toward men vs. not men. 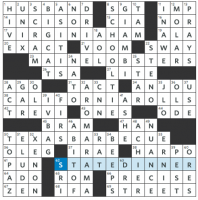 Maybe it’s what crossword constructors favor, maybe it’s what is loaded into constructors’ word lists? Whatever the cause, this isn’t great. Even if you had the same grid, you could at the very least clue HARPO as Oprah’s company and clue some of the other fill via women related to them. When women don’t see themselves reflected, they notice – and it matters. This seemed harder than a standard Tuesday. It also seemed more interesting than a standard Tuesday. There’s no revealer (at least not one that I noticed) so I wonder how many people were left wondering what exactly was going on. For me that’s a feature. For less experienced solvers, I suspect it’s a bug. The theme answers are all wacky phrases composed (!) of the names of musicals, with the years each musical debuted in brackets. 17a [Megacorporation? [1996, 1970] ] is BIG COMPANY. 26a [Pomade? [1968, 1972] ] is HAIR GREASE. 61a [Melted? [2018, 2012] ] is FROZEN ONCE. I love this theme, especially without a revealer. I love musicals and have heard of all of these, although I haven’t seen them all. I never realized there were so many musicals with one-word titles. I got off to a slow start because 1a [Mends with stitches] made me think of suturing. Luckily, 1d [___ Ferry, N.Y.] is a gimme for this Westchester County native. Once I had DOBBS, I realized 1a was DARNS. 2d [Running wild] is ARIOT, which is at best obsolete, and the confluence of the three made the NW much harder than I expect for an early-week puzzle. 8d [Carte that comes before the course] is MENU. Love this. 31d [Fall setting] is EDEN – the Fall of Man, not autumn. More NY-centricism with 43d [Duane ___ (pharmacy)]. Would non-New Yorkers get READE? What I didn’t know before I did this puzzle: that “boondocks” comes to us from TAGALOG. I suspect this puzzle will generate a bimodal distribution – love it or hate it. I love it. 4.5 stars from me. The first two themers also have a word with one vowel, so I at first thought that the theme answers used exclusively words with one vowel. That is not the case, but it is except for only two words! (SOME and ELDER have two). But even if there was only one vowel in each word, how would you title that? This works just fine, although it does seem like there is a slightly better title out there somewhere. Still a fun puzzle, and are there any more instances of a seven letter word with one vowel in the middle? 4.3 stars today. 13A [Its state song is the creatively titled “The Song of [that state]”] IOWA – This is a long way to go for this answer! 14A [Potato often used for fries] RUSSET – Including McDonald’s french fries, which are pretty good even though I have seen Supersize Me! and I know they don’t decompose! 61A [The O. Henry __-Off] PUN – I had to look this up. Looks like this competition is right up the alley of us wordsters! 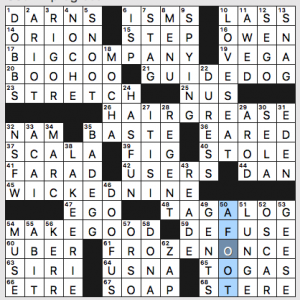 9D [Boil down] DECOCT – I saw this word also in another puzzle this week, and I don’t remember ever learning this word! 10D [Kiddos] LITTLE ONES – Aww! Cute! 15D [Words after “on” or “by”] THE HOUR – This one fooled me good. Very clever! 27D [Without being asked] UNBID – This is technically correct, but why am I thinking of an adjective for an unsold auction lot? 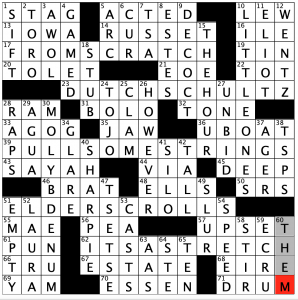 30D [Element #42 (which for some reason isn’t in as many puzzles as, say, 19-Across)] MOLYBDENUM – 19A is TIN. This is also a long way to go for this clue, but a lot of fun! 40D [Permanent marker brand] SHARPIE – I bought a full range of colored Sharpies a few years ago. I cannot remember, even to this day, what I bought them for! To put it plainly, each theme answer is a phrase that starts with a card suit and ends with another word that “follows suit.” Cut the deck! What game are you in the mood for now? Bridge? Euchre? Gin? Spades? Hearts? I haven’t played cards in years!! Maybe I am just getting old, but I suppose I have to teach my 6 year old at least how to play War! I will work on that this week! 4.4 stars for this joker-less puzzle! 23A [Chinese menu promise] NO MSG – This is basically just salt, and according to Adam Ruins Everything it isn’t any worse for you than that. I’m still eating my Chinese food with it in there or not! 61A [Diarist Nin] ANAÏS – I have not read one single thing she has written, although she is definitely crossword-famous! 62A & 50D & 14D [Fairy tale opening] ONCE – UPON A – TIME – I see what you did there! Clever and well executed! 18D [Like an accurate soccer shot] ON GOAL – I think this is an actual stat in soccer. 32D [Twain/Harte play] AH SIN – Never heard of it! This is evidently about a Chinese man named Ah Sin. Wow. Is this still being performed in theaters?? 39D [Least fatty, as corned beef] LEANEST – Trust me: you WANT your corned beef fatty! This entry was posted in Daily Puzzles and tagged Elizabeth C. Gorski, Matt Jones, Paul Coulter, Roland Huget, Sam Buchbinder. Bookmark the permalink. I sent the same theme in to the New York Times in February 2016 (with entries RAGTIME CATS, GYPSY HAIRSPRAY, COMPANY PASSION, and TITANIC RENT) and was rejected. What gives? I’m lukewarm on your first two, but TITANIC RENT is great! “The Rent Is Too Damn High.” TITANIC RENT is better than any of the themers in the NYT puzzle. I like RAGTIME CATS. Cats playing Scott Joplin on their pianos! I’d do that puzzle, too. Sorry it was rejected. given the backlog of NYT puzzles — esp midweek puzzles — it’s quite possible Will had recently accepted this puzzle and didn’t want a second such in his hopper. It’s also possible that your fill wasn’t great. Did you get any feedback with the rejection? Not a big theater fan – I was 5-of-8 on the shows, but crosses and/or the punny clues made them all gettable. Didn’t know BIG, NINE or ONCE – is BIG related to the Tom Hanks movie with the same title? 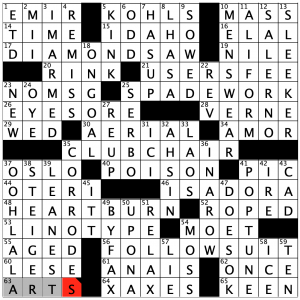 Sign I’m doing too many crosswords – 12-D, SEGO with no crosses (and I don’t live in Utah). Yes, “Big” is an adaptation of the Tom Hanks movie. Odd how many were films turned into musical theater. Since I was ignoring the dates, that actually misled me as to the theme—BIG, FROZEN, ONCE, and GREASE I was able to put comfortably into the “movie” bucket in my head. HAIR and WICKED should have jostled me loose from that thought, but the balance of the one-worders were meaningless to me as either films or musicals; I just took them on faith. I guess it goes both ways – HAIR and GREASE were Broadway musicals before being made into movies, and I understand there is a movie version of WICKED in the works. So 46A for Liz Gorski’s puzzle has “of” in both the clue and answer. Isn’t duping a word in both a clue and its answer frowned upon? Overall, great puzzle. Man, the NYT is determined to erase AROD’s Seattle and Texas career out of existence, isn’t it? I don’t think I’ve ever seen an AROD clue that acknowledged he was ever a non-Yankee, but it really stands out today. Throw in the theme, Duane Reade, Dobb’s Ferry, and this is one NYC-centric puzzle. I mean, it *is* The New York Times. DOBBS and READE are definitely very NYC-centric answers. As a long-suffering Mariners fan, I’d just as well forget they ever had any good teams (that utterly blew it in the playoffs) and so am happy to pretend AROD never played there. In the LAT, a LINOTYPE is not a “printing machine.” It’s a typesetting machine. The printing machine of that era was called a letterpress or just a press. You would think people working at a newspaper would know that. There’s actually quite a few more CCCVCCC words; naturally most end in S, and I see most also start with S. Some common and/or interesting examples: chrisms, schisms, scripts, scrunch, shrinks, shtetls, spliffs, splotch, spright, strands, strings, thrills, throngs, thrusts, thwacks. I just wanted to say the dancing in that video clip was amazing… Thanks Jenni. Jeez, Matt Jones seems to really be reaching of late, sadly. So much esoteric and arcane cultural fill, and not to mention (53D), ‘casting’ dice means to create them, not throw them. Normal people say ‘roll the dice’, either literally or figuratively. Not ideal, but it exists. And yeah, in current vernacular, “roll the dice” is better. It’s true that if you have 5 theme entries (1 word for each of the 5 vowels, btw), because of the constraints, sometimes the rest of the fill can be somewhat compromised. I’ve only ever heard the term ‘the die is cast’, and thinking it was referring to the materials-shaping device (like metal-smiths use), and that dice were/are created, as such. Wasn’t aware of the idiom that goes back to Caesar crossing the Rubicon, my bad.